The new Ascension Reiki Handbook was published by Iona Light Books in 2009 on the 10th anniversary of the first edition. It is available direct from Iona Light and costs £42 including UK P&P. 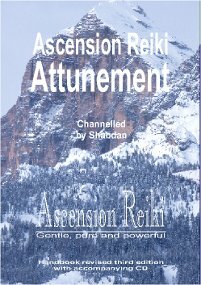 Ascension Reiki is a self-attunement system, designed that way by Spirit to make it easily acessible to everyone, although Shabdan occasionally offers personal attunement courses. Please note that no other healers are currently authorised to offer Ascension Reiki attunements in the system Shabdan helped to develop with Joseph of Aragon. Any Ascension Reiki handbook that is not the official version published by Iona Light Books (A4 softback publication with bar code, ISBN and free attunement CD), or is a copy, is not valid and may have an out-of-date attunement symbol. Practitioners advertising our Ascension Reiki attunements without our written consent are unauthorised and may be violating copyright. We have an approved source of handbooks for self-attunement in the United States who can also offer supervised group self-attunements - please contact us for details. We are happy to despatch handbooks worldwide. This symbol holds the qualities of One, Wholeness in Being, drawing the One state to the recipient and freeing the soul of limitations. Ascension Reiki is a milky soft Ascension energy brought forward by Joseph of Aragon to help all healers and their clients prepare for Ascension by drawing new high-vibration energies into their auras and light bodies. The symbols were given to Shabdan in 1998 and the first handbook was issued in 1999. Since then, hundreds of people have attuned to this wonderful system that contains 19 ascension symbols and now represents levels 2-6 of conventional Reiki (where traditional Reiki Mastership is equivalent to level 3). Until 2008, Ascension Reiki correlated to levels 1-5, but energy shifts at that time raised the frequency of all of Shabdan's tools including Ascension Reiki. This is exciting because it means that Ascension Reiki can grow with you as you develop and progress. The Ascension Reiki system has been designed for self-attunement so that it can be widely and easily accessed and used. Ascension Reiki Guides (who are almost always the same as your Reiki guides if you already practise traditional Reiki) oversee the attunement process and all subsequent healings. Using the handbook and guidance CD, you can attune to the energies yourself or in a group. Your Ascension Reiki Guide will come to you and ensure that the energy levels you bring through are always appropriate to your skill level and to the vibration of those who receive healing through you. "Ascension Reiki is a great help in my spiritual development. I feel it facilitates other healing processes and clearings. A wonderful tool I'm deeply grateful to have - strong, powerful and with immediate results." By attuning to and using Ascension Reiki, you join a growing number of lightworkers and healers working with Ascension Reiki energies and helping to bring new levels of awareness and healing to Earth. This is powerful work for the Light. If you choose to continue your journey by seeking further attunements, there are currently 4 levels of An-tu (pure love) attunement available. These attunements are done in person over three days, as each attunement has several components. An-tu healing has been likened to dropping a pebble in a clear pool - the ripples radiate out from your hands and aura, sending energy to the recipient and the immediate environment. This gentle healing pathway is open to all those who have attuned to and used Ascension Reiki. "I have used Ascension Reiki on myself for twelve months and also on friends who are healers and every one of them has siad the same thing - WOW. If you have a serious commitment to your healing process then I can recommend Ascension Reiki with my whole heart." "My Reiki clients were pleased to try Ascension Reiki and loved the energies, which they described as "lighter" and "finer" than the Reiki they had been accustomed to. My Ascension Reiki guide came forward and gave me constant guidance throughout the healings."